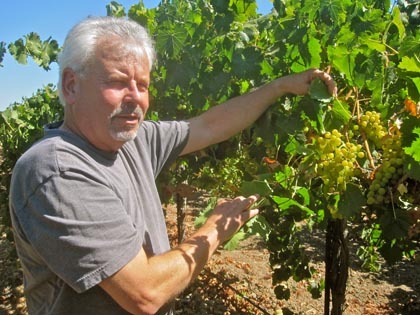 One of Lodi's singularly most original, and quite possibly most significant (if you dream in Italian) white wines today may be the one made from the Vermentino grape by Jim Moore, owner/winemaker of Italian inspired wines under the Uvaggio label. "Vermentino," says Moore, "is the thinking man's Pinot Grigio." Like Pinot Grigio, it tends to be light, dry and breezy; lemony tart without being puckery. 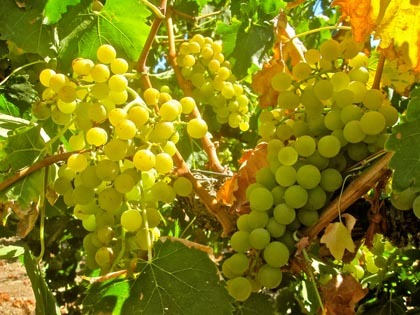 Where Vermentino veers off – as in the 2009 Uvaggio Lodi Vermentino ($13-$14 retail) – is in its multifaceted nose: lavender, thyme and lime blossom fragrances, with undertones of cantaloupe and nuances of wild honey and cream. On the palate, it is silkier than your typical Pinot Grigio, the crisp qualities popping through the fleshy fruit, stony and woody herb sensations. So what brought Mr. Moore to this point where, lance tilted towards windmills, he is championing a still somewhat obscure white wine grape of Sardinia and Corsica (also known as Rolle in Southern France, and thought to be related to the Pigato in Italy's Liguria)? I-coulda-been-a-contender is what Moore sounds like, when he talks about his 19 years spent as an associate winemaker at Robert Mondavi. In fact, his white hair, scraggly beard, and eyes at one moment pensive and in the next moment fiery with passion, Moore almost channels a matured Brando, had the latter not gotten rich and fat and took to wearing mu`umu`us on a private island in Tahiti. Moore's major opus at Mondavi's was the now defunct Cal-Ital label called La Famiglia di Robert Mondavi. Moore tells his story: "I conceived, planned and executed that project. I also re-introduced high end zin at Mondavi, did a makeover of Moscato d'Oro, and played a major role in the development of Lucente (the latter, Mondavi's Supertuscan red produced as a joint venture with the Frescobaldi family). But by 1998, I had enough of the in-house politics and jockeying for positions, and I was especially riled by the fact that La Famiglia was not headed in the direction of the winery's own original goal, which was to skirt a cutting edge." "Robert Mondavi Winery," he tells us, "was no longer walking the walk." In the immediate aftermath, Moore did what many winemakers who toil for years at other people's wineries do: he started his own company, called L'Uvaggio di Giacomo – which means, Moore blithely tells us, "Jim's wines." But making wine and selling it are two different things, as Moore also quickly discovered; and it's not easy to walk that walk, especially on your lonesome. When unsold vintages began to pile up in the warehouse, Moore went back to working for someone else: in 2003-2004, for Bonny Doon (helping to "put production in order" for the eventual sale of that winery's Big House and Cardinal Zin brands). Soon after an opportunity to design and implement a brand new start-up winery in Napa Valley as a full-time consultant came around, and Moore suddenly found himself in the position of being able to pick up the threads of L'Uvaggio di Giacomo once again. Renewing a longtime friendship with Rod Schatz of Lodi's Peltier Station, who had planted Vermentino for Moore back in the nineties when he was guiding La Famiglia, Moore re-introduced Uvaggio Vermentino to the market: and this time, key retailers like Darrell Corti (of Corti Brothers) in Sacramento and San Francisco's Ferry Plaza Wine Merchant, adventurous sommeliers in the Bay Area and Napa Valley, and various elements of the wine geek community at large began to take notice. The time was riper… the contender was back. Why source from Lodi, we asked Mr. Moore? "The joke answer and the serious answer are the same," says Moore. "Not only is it more than possible to grow Vermentino, and other Italian varieties like Barbera, Primitivo, and Teroldego in Lodi, Lodi is the land of cost-effective viticulture. No one in Napa Valley would take the risk with me with adventurous, esoteric grapes. They are risk-adversive on the North Coast. "Rod (of Peltier Station) is a bit of a cowboy anyway, especially when it comes to winemaking experiments. Plus, I didn't want to make expensive wine. 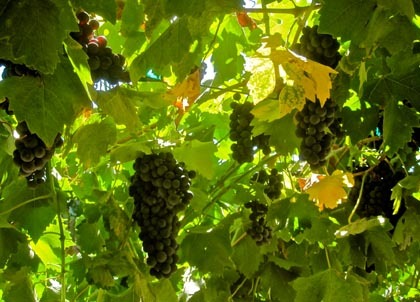 I don't want to buy North Coast grapes for $3,000 or $4,000 a ton and make $50 wine. All Uvaggio wines are under $20 – consumers are extremely price-sensitive these days – and I can get all the high quality grapes I need in Lodi and still sell at that mid-low 'teen price. "Let's put it another way," adds Moore. "I didn't want to repeat previous mistakes, like what I saw at Mondavi. 'PQR,' or Price-Quality-Ratio, is what Lodi does well. I'm hanging my hat on Vermentino because it's kind of a sweet, little bright spot that consumers who like Pinot Grigio can identify with. Besides, I think consumer interest in experimenting with new things is coming back, especially with the echo-boomers, and the new millennials. Vermentino may be where Fumé Blanc was in 1968, and it's ready for a breakout. I also want to help Lodi break out as a region – away from the stranglehold of the big producers, and become more identified with small, specialty winemakers, appealing to the consumers who want something different." Needless to say, a winemaker like Moore is also diversified. Tasting us on his 2008 Uvaggio Lodi Moscato Secco ($18), he tells us: "this dry white wine is made from the Moscato Giallo, the "Golden Muscat," rather than the Moscato Bianco most California Muscats are made from. Kevin Delu, who I met in 2005, grows this for us, and it makes a beautiful wine with amazing flavor and acidity." 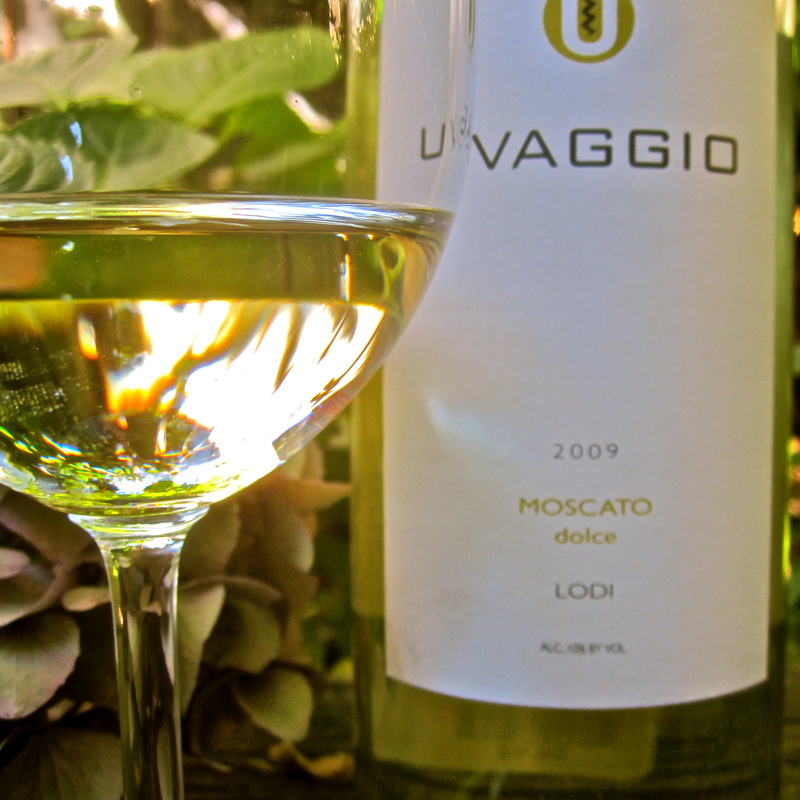 We also tasted a sweet, dessert style white made from the same grape, the 2009 Uvaggio Lodi Moscato Dolce ($18): light as a feather and even more fragrant – bursting with orange blossoms, cinnamon, white pepper and mildly musky spices – and bright, lively and tangy on the palate. "The sweet Moscato Giallo is made from the same vineyard, but left hanging on the vine a month longer," says Moore. "There is really no difference is the sugar level when it is picked, but the hang time gives it that much more complexity, and we ferment it to just 8.5% alcohol to let the residual sugar show that beautiful fruitiness." Out in the vineyards planted by Delu, Moore shows us his Primitivo – a grape genetically identical to Zinfandel, yet obviously so much different in the field: markedly smaller clusters than that of typical Zinfandels, composed of smaller berries of more uniform size. "Primitivo is the kind of Zinfandel I like to make," Moore tells us. "Even at its ripest, it is not as raisiny or pruny as Zinfandel, and you can make a well balanced red wine, more ideal with food." The 2009 Uvaggio Lodi Primitivo ($18) will be Moore's first Primitivo release (slated for February 2011), and it glistens with cherry/black berry fruitiness; soft, easy and zesty on the palate. 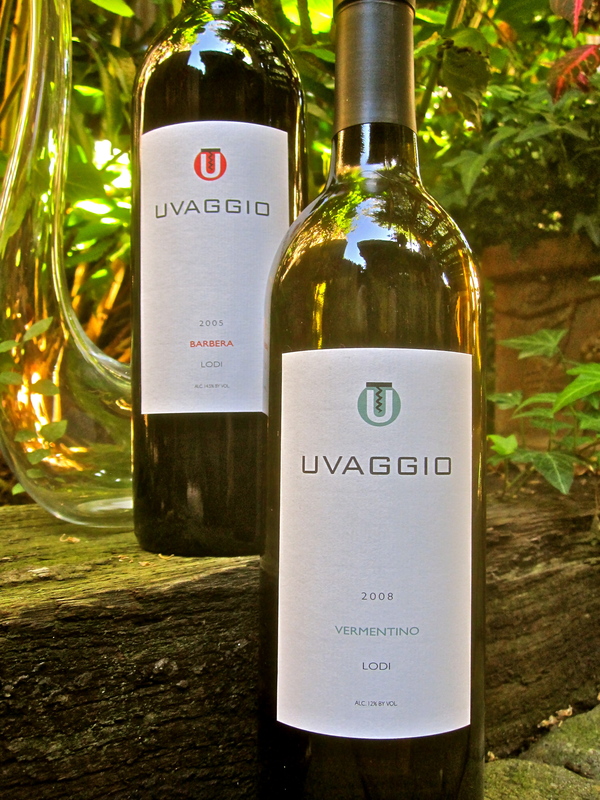 There is also a 2007 Uvaggio Lodi Barbera ($18) in current release, from a vineyard in Lodi's Mokelumne River farmed by Ted Leventini (whose Barbera grapes also go to Stuart Spencer's St. Amant Winery). Moore's Barbera is medium bodied, smooth and zesty with natural acidity, underlining sweet blackberryish fruit, unimpeded by moderated tannin. 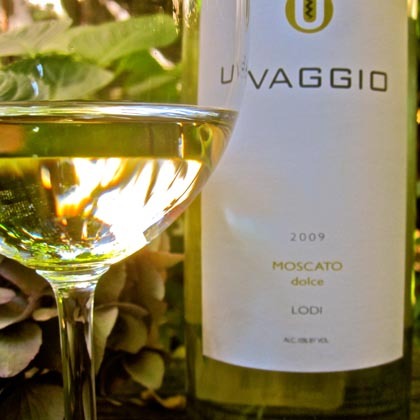 On the back of the Uvaggio bottles wine lovers are encouraged to "move beyond chocolate and vanilla," and experience "new" flavors like Barbera, Primitivo, Vermentino and Moscato. Do that, and it's one more step for the smaller, more adventurous producers of the world who believe that truly good, food-worthy wine need not be a burden on the budget – not a bad thing at all! Vermentino: I feel there is nothing better than a seafood salad comprised of either par boiled squid or shrimp (preferably some of both) or grilled octopus (maybe with roasted fingerling potatoes on the octopus version) using some chopped celery, perhaps a little onion, lightly dressed with olive oil and a dash of lemon juice and mildly seasoned with cracked pepper and Italian parsley. Primitivo: I would opt for a lighter white meat like chicken breast or pork tenderloin very lightly seasoned with salt and pepper and simply grilled, accompanied with polenta and salad. Barbera: Perhaps a grilled ribeye and a rich pasta with oil and cheese, or even cream, along with bread to sop up everything and a salad for some green. Moscato Secco (dry): A salad of smoked trout or smoked salmon on a bed of escarole or frisée with some shaved fennel and some toasted almonds dressed with a vinaigrette. Moscato Dolce (sweet): A dried cheese with a caramel aspect like aged Gouda or having salty protein crystals like Parmigiano; but the least caloric and less expensive match is amaretti – those airy cookies made from ground almond and egg whites (but without any Amaretto liqueur).